Classical guitarist Murray Mandel will be performing in Dandenong next week to raise money for LifeLine. 190154_02. 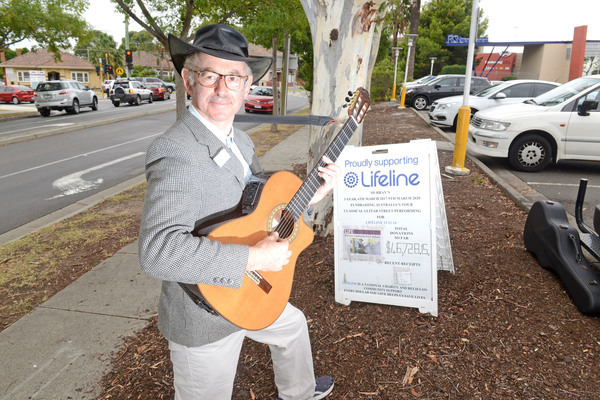 Classical guitarist Murray Mandel will be performing in Dandenong next week as part of his three year fundraising/public awareness Australian tour for Lifeline. Mr Mandel’s journey began in Canberra in March 2017. He will be travelling more or less anticlockwise around Australia with his campervan, and ending in Canberra in March 2020. The Sydney musician will be performing at Armada Shopping Plaza in Dandenong four times, from February 13 to 16, 10am to 2pm. Armada Shopping Plaza is the 117th shopping complex to host him, and Wednesday will be his 283rd performance. “This fundraising tour is out of my sense of compassion – it’s a gruelling tour but a real privilege to reach out and remind as many Australians as possible about Lifelife and that Lifeline is always available 24 hours a day, seven days a week,” Mr Mandel said. So far, directly, Mr Mandel’s performances have raised $46,728.45. 100 percent of the donations are forwarded to the Lifeline state/regional branches. “The accolades have had been forwarded to me from at least 1200 passers-by,” he said.